In the words of Aerosmith frontman Steven Tyler, it’s the same old story, same old song and dance, my friends. You’re on LinkedIn, your profile has been perfected to shine. You’ve modified your Facebook privacy settings to disallow friends and family from posting photos of you at a party in 1996. You’ve spent some time on Twitter crafting a descriptive one-line summary and following the relevant thought leaders in your industry. And if you’re really good, you might even have a blog. So are you on Pinterest yet? 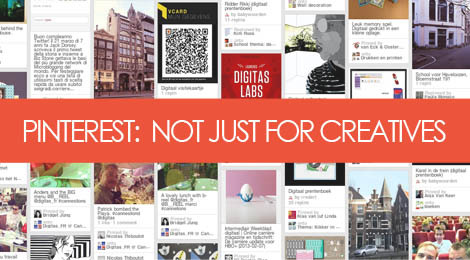 “I thought it was mostly for creatives.” I was an early adopter of Pinterest a year or so ago back when it was still an invite-only social media experiment primarily geared towards artists, designers, cooking and beauty enthusiasts – areas that are highly visual in nature and lend themselves well toward the platform. I initially disregarded it as a valid job search tool because the level of engagement with other users was extremely limited, and unless you’re a creative professional, job searching doesn’t have much of a visual component. Plus, it simply wasn’t designed around the notion of serving that market segment. Plus, it simply wasn’t designed around the notion of serving that market segment. Global marketing agency Digitas has a strong Pinterest presence, with a collection of boards highlighting things like “Talent, Work & Workspace” that gives you a look inside the agency. Fitting into the culture of an organization is just as important as your skill-based qualifications, and this is a great way to get a sense of the work environment. What are people wearing? How are they interacting with one another? What kinds of social and work-related events do they regularly engage in? Can you see yourself thriving in that kind of environment? Like many companies, Digitas has boards dedicated to special or niche projects they’ve worked on, which is a great tool for candidates trying to get a sense of what kinds of skills and experience the company values, and what kinds of projects would be best to highlight in your resume and marketing materials. How does the recent philanthropic work the company has done lately jibe with your own personal interests or values, for example? One board is full of colorful infographics addressing relevant industry topics from visual storytelling, to social media influence, to decision making across the product lifecycle. Another pharma company has boards dedicated to new drugs & therapies at the forefront of treatments for diseases and ailments that center on the work they do. This is the language they speak, the topics that ring relevant and are important to them as major players in the industry, and a great way to establish your credibility by highlighting your knowledge of such areas into your conversation, your blog, and your personal brand. Many global organizations like Digitas, McCann, even pharmaceutical companies, have separate boards and sometimes accounts dedicated to their different global offices. And this is an excellent way to get the global perspective of what’s going on in the company, what are different arms of the organization doing in their different offices, are there similarities in culture, differences, interesting threads that connect the company across multiple continents? Having insight and understanding into the company at this level goes above and beyond, and it clearly shows that you not only did your research, but take an avid interest in the organization and their impact. While it might not be as direct an approach as say, networking via LinkedIn, or applying to an opportunity on the company’s website, Pinterest helps you dig deeper to find that relevant, crucial information that can really help you position yourself as someone who understands the mission, values, and interests of the company. Skill and experience qualifications are a core requirement, but it’s these less-obvious pieces of the equation that will help you stand out against the competition and appeal to the human aspect of the organization. Tags: career, communication, job search, marketing, personal branding, pinterest, social media. Bookmark the permalink.